TETRA technology allows radios to be used as interactive paperless forms – or Smart Radio Apps. One of these Apps is the Take 5 App where a list of tools and safety procedures can be selected to complete a dangerous task. The radio handset is now used to enter information through the keypad. 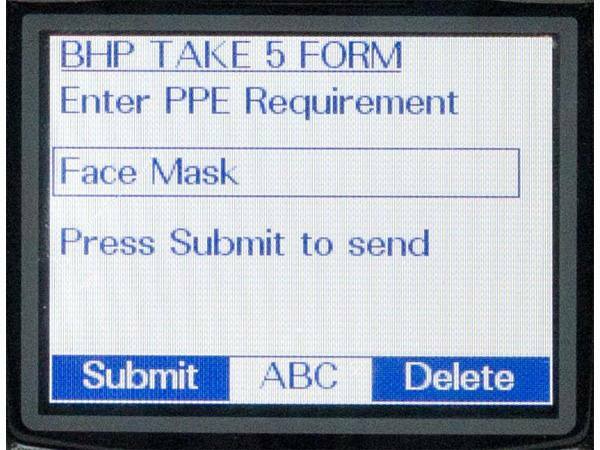 As the Take 5 form is filled, the OHS databases are automatically completed, alleviating the need for manual data entry on the traditional Take 5 paper forms. This saves the client hours of manual data gathering and safety data is updated live. The BVR team created Take 5 electronic forms using Sepura’s SDA templates.